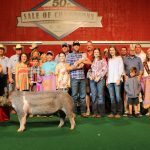 Matthew Butterfield, of Butler County, sold his grand champion market barrow at the Ohio State Fair for $41,000 to Meijer. 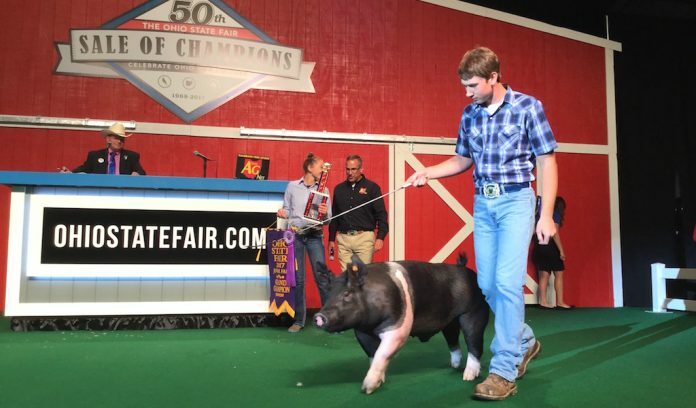 The exhibitor cap was $10,000. 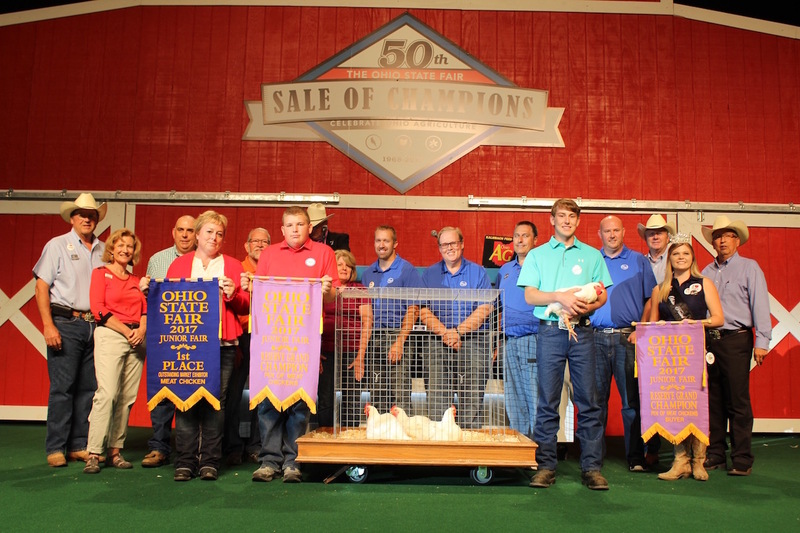 COLUMBUS — The 50th Ohio State Fair Sale of Champions livestock auction was held Aug. 6, the final day of the fair. 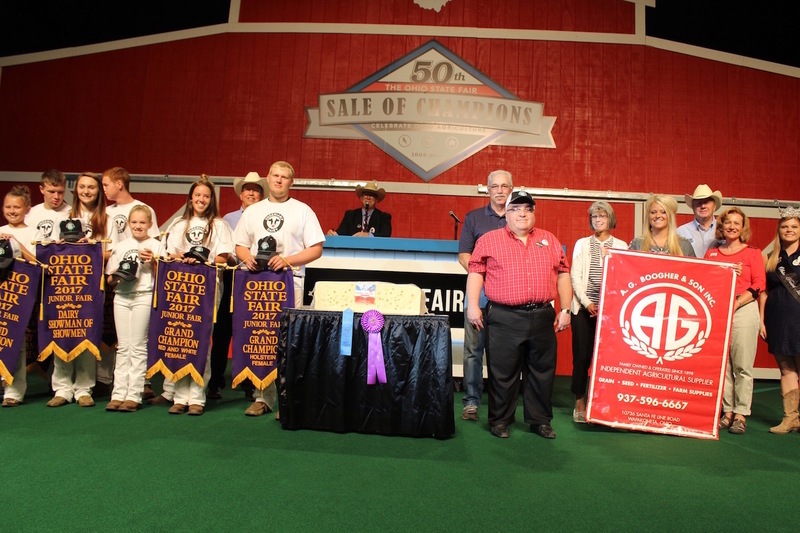 On the sale bill were grand champion and reserve champion market lambs, market barrows and market beef, as well as grand champion market goat, grand champion and reserve champion market chickens, grand champion market turkey and a block of Swiss cheese, which represented the seven dairy champions. 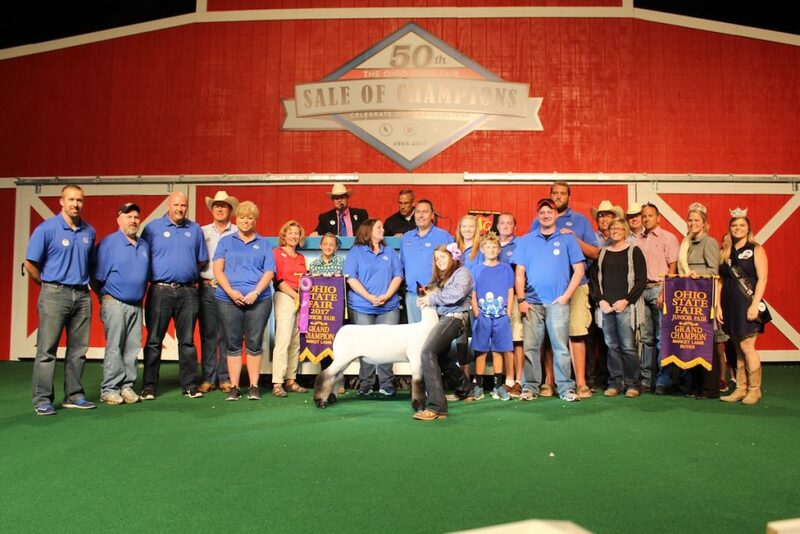 Carly Gump, of Miami County, sold her reserve champion lamb at the Ohio State Fair for $18,000 to Huffman’s Market. The exhibitor cap was $7,000. Zac Ortman, of Perry County, sold his reserve champion market chickens at the Ohio State Fair for $11,000 to The Kroger Co., and Gerber Poultry. The exhibitor cap was $4,000. 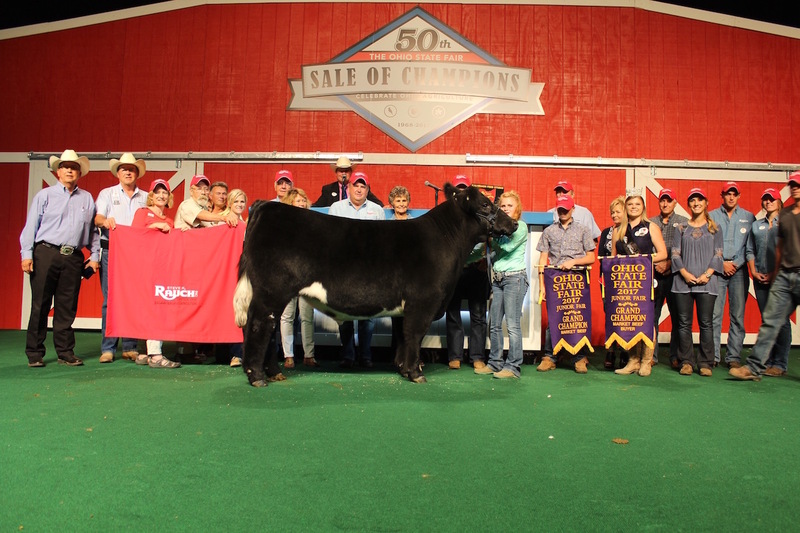 Montana Hulsmeyer, of Allen County, sold her reserve champion market beef steer for $36,000 to The Kroger Co. 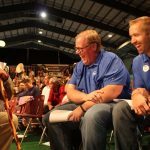 The exhibitor cap was $11,000. 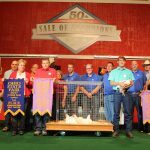 Milan Pozderac, of Knox County, sold his champion turkey at the Ohio State Fair for $15,000 to the Ohio Harness Horseman’s Association, Kale Marketing, and Cooper Farms. 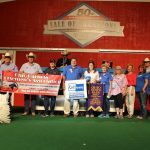 The exhibitor cap was $3,000. 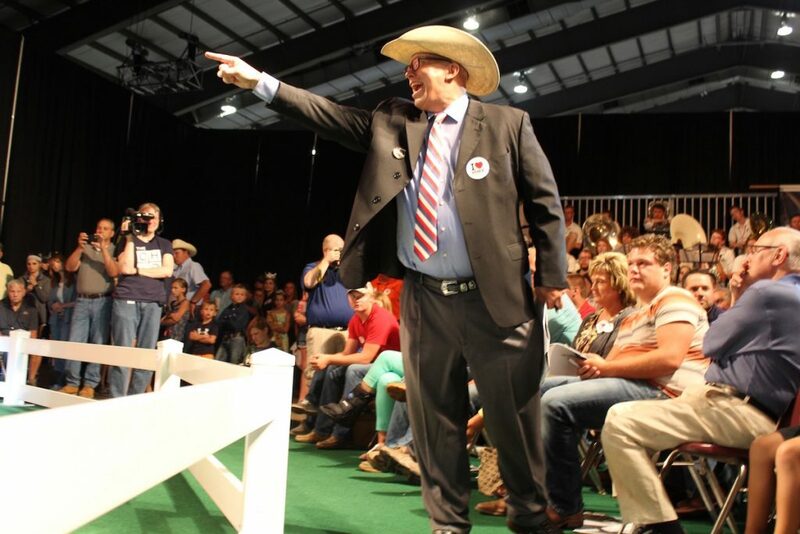 Auctioneer Steve Andrews takes the bids from The Kroger Co.
Auctioneer Kevin Wendt calling in a bid. 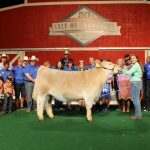 The grand champion Swiss Cheese, from Pearl Valley Cheese Co., was bought for $22,000 by AG Boogher and Sons, S & S Volvo and GMC Trucks. 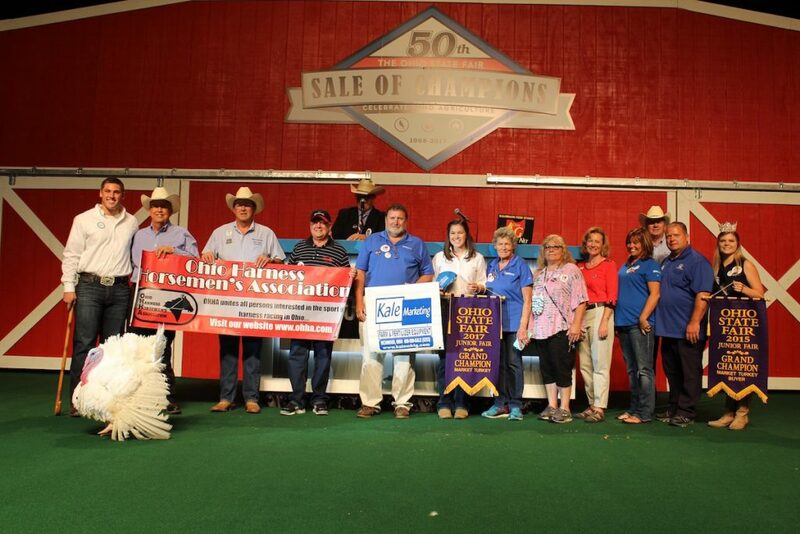 The exhibitor cap was $3,000. 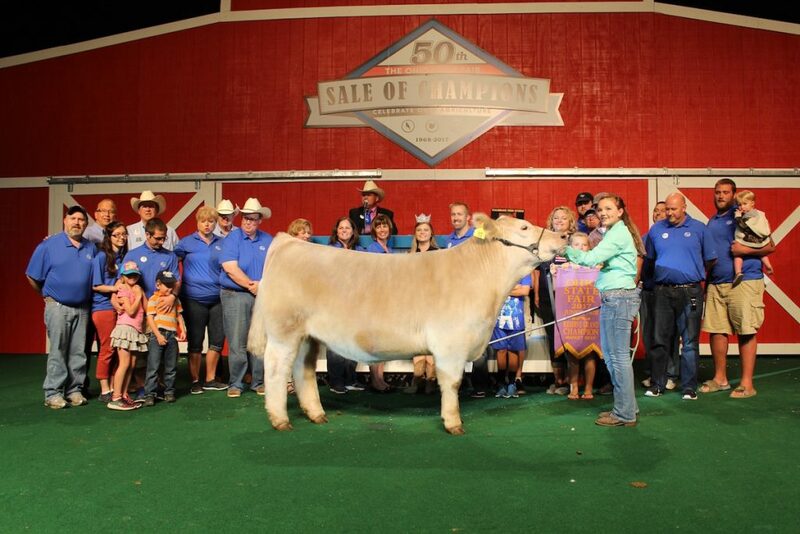 The champion Ayrshire was represented by Lane Greiwe, Shelby County; champion Brown Swiss, Keaton Topp, Shelby County; champion Guernsey, Aubree Topp, Shelby County; champion Holstein, Kris Ackley, Logan County; champion Jersey, Allison Francis, Darke County; champion Milking Shorthorn, Somer Reid, Guernsey County; and champion Red and White, Ally Cupps, Champaign County. 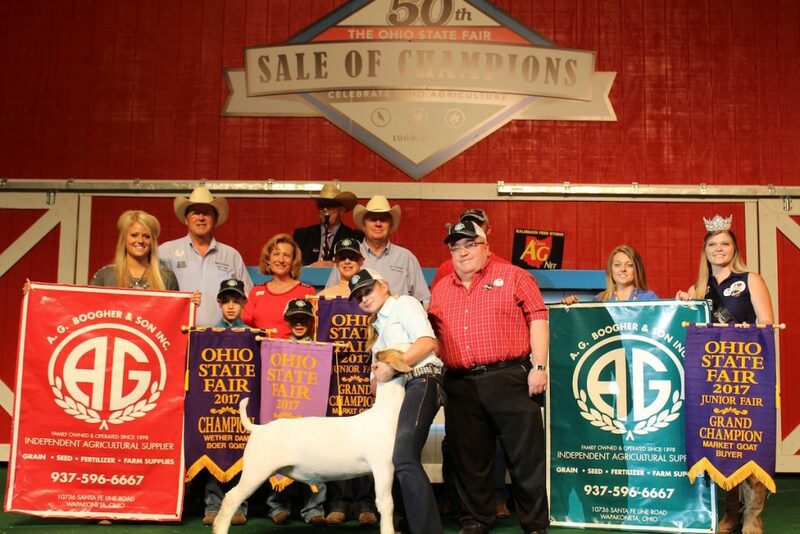 Paige Pence, of Clark County, sold her champion market goat at the Ohio State Fair for $15,000 to AG Boogher and Sons, and S & S Volvo and GMC Trucks. 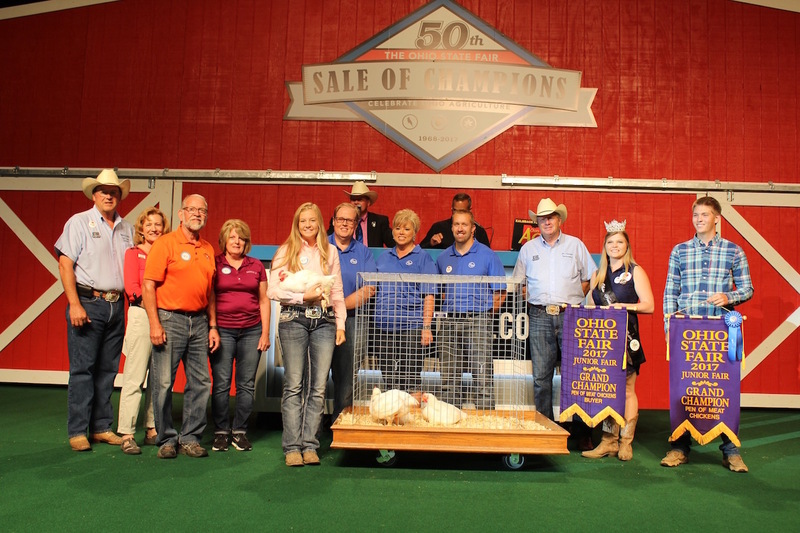 The exhibitor cap was $5,000. 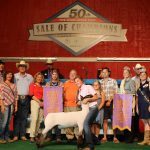 Bailee Amstutz, of Union County, sold her grand champion market lamb for $29,000 at the Ohio State Fair to The Kroger Co. 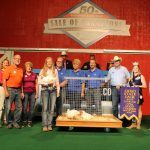 The exhibitor cap was $10,000. 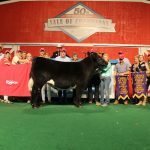 Addison Jones, of Allen County, sold her grand champion market beef steer at the Ohio State Fair for $50,000 to Steven R. Rauch, Inc. 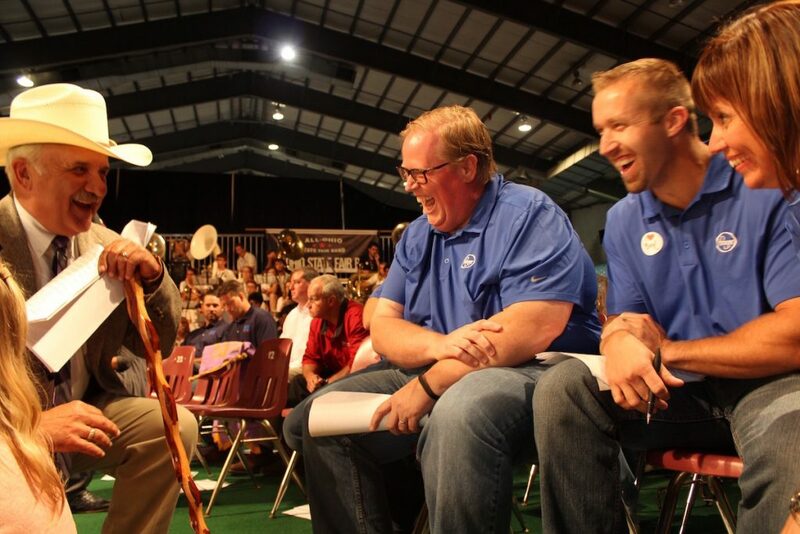 The exhibitor cap was $22,000. 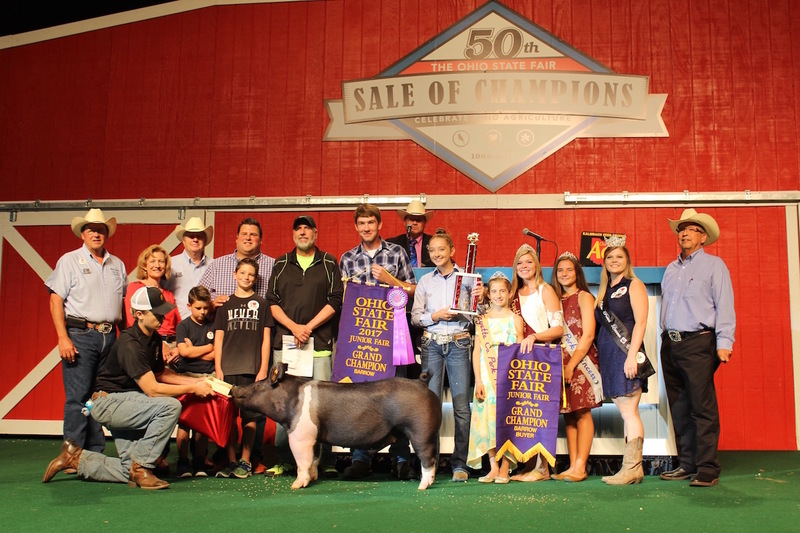 Ella Sprang, of Holmes County, sold her reserve champion market barrow at the Ohio State Fair for a record $32,000 to Bob Evans Farms, Event Marketing Strategies, Huffman’s Market and Ohio Farm Bureau Federation. The exhibitor cap was $7,000. 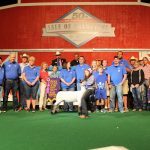 The livestock raised a total of $284,000. 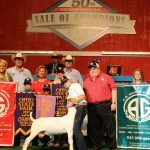 This year’s sale broke one record. 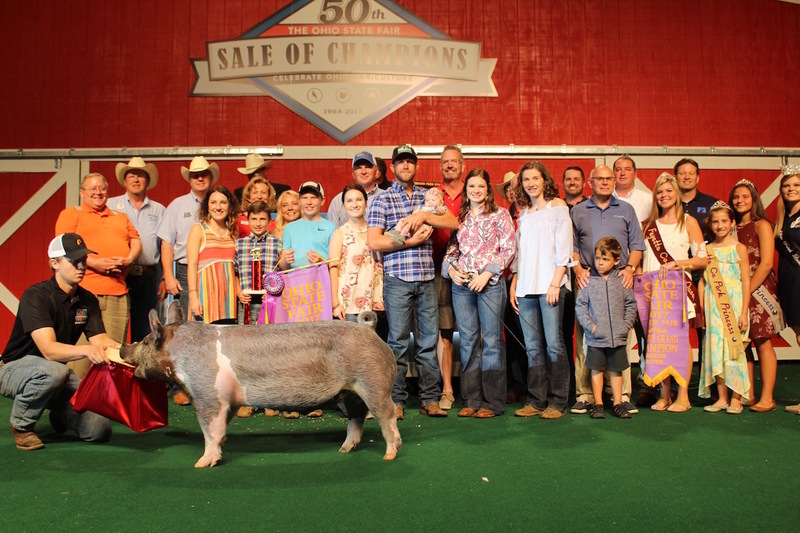 The reserve grand champion market barrow sold for $32,000, breaking the previous record of $31,000, set in 2013. 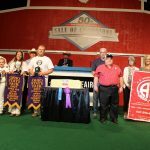 Since 1995, the Ohio State Fair has placed caps on the amount exhibitors can earn from their exhibits’ sales. Money exceeding the cap amounts is distributed to reward other youth exhibitors through the Youth Reserve Program. The program allots funds for scholarships, the outstanding market exhibitor program, FFA, 4-H, skillathons, outstanding breeding exhibitor program, showmanship, All-Ohio State Fair Band and Youth Choir and other Fair competition winners. 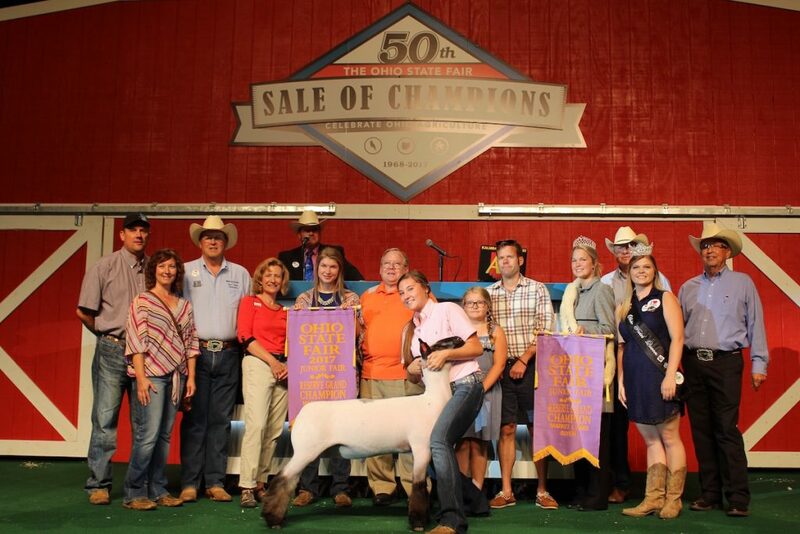 A total of $196,000 from this year’s sale went to the youth program. 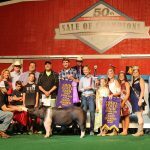 Since its inception, the Youth Reserve Program has awarded $3.2 million to approximately 33,600 youth exhibitors. 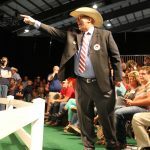 Purchased by: Steven R. Rauch, Inc.